Jane Austen's novels in their quiet English settings have always been delightfully revealing about the early years of the nineteenth century and Regency England. They reflect the cross currents of 'Taste and Feeling' - the dilemmas of heroines when their well-established Georgian standards are confronted with challenging new romantic ideas and attitudes to society and the environment. The dilemmas are played out in landscaped parks and cottage gardens. 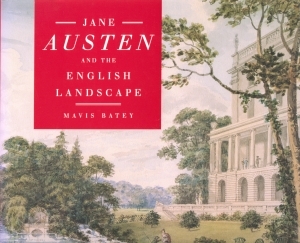 Landscape and landscaping were lively and often emotive issues during Jane Austen's lifetime and her letters and novels reflect the new ideas on Nature and the environment manifest in literature, painting, the picturesque discovery of Britain and landscape gardening. Although it was the poet Cowper's feeling for homely rural scenes which best suited her taste, Jane Austen took a great interest in fashionable landscape improvement and was beginning to come to terms with the new romantic attitudes to landscape in the writings of Scott and Byron. It was a time when every landowner was seeing what he could do to improve the view and lay out the shrubbery. As Mavis Batey shows, Jane Austen's brother Edward was certainly influenced by Humphry Repton, the leading landscape gardener of the day, and his work for their cousin at Stoneleigh Abbey. Back at Chawton House there was much family discussion over closing footpaths and widening views. From her knowledge and enquiries Mrs Batey is able to reveal how these discussions relate to the writing of Mansfield Park and other novels. The book is beautifully illustrated both with photographs of the houses, landscapes, parks and gardens that Jane Austen knew and with the work of contemporary painters such as Constable, Turner and Stubbs. There are also watercolours and drawings (many still in the family archives) of the same scenes and estate maps, plans and engravings from contemporary manuals on landscaping. Barn Elms has chosen a large format so that the detail in the delicate watercolours of the period can be seen to best advantage. The book is beautifully designed and elegantly set so that its scholarship may grace the library of every cultivated household. About the Author: No one could be better placed to lead us through these landscapes than Mavis Batey, best known as President of the Garden History Society and active in the conservation of historic parks and gardens. She is the author of many lively books and has been a Jane Austen enthusiast all her life. She is a regular lecturer to the Jane Austen Societies of both Great Britain and the United States and her knowledge of Regency gardening is unparalleled. Recently she has been advising the new American owner of Chawton House on the restoration of the Regency landscape and was the BBC's natural choice as gardens adviser for their new production of Pride and Prejudice. Among her previous books are Oxford Gardens, The English Garden Tour (with David Lambert), Regency Gardens and the perennial favourite, Alice's Adventures in Oxford. Mavis Batey, President of the Garden History Society, has been a driving force behind the new discipline of garden history and a leader of the campaign to see the fragile fabric of historic landscapes and gardens firmly placed on the conservation agenda.